End your digital camera battery problems! MORE POWER for your digital camera! Publication date: 1 February 1999. The second worst thing about digital cameras, after their price, is their battery consumption. Even models without power-sucking LCD screens and flashes still eat batteries faster than film cameras, because of the amp-hungry onboard electronics. Many digital cameras run from AA cells (a "battery" is more than one cell), usually four of them, and they’re renowned for draining a set of alkaline cells in less than an hour of shooting. Sometimes much less. My own Kodak DC120 can certainly do this trick. Its current draw varies from 200mA (milliamps; 1000 milliamps are one amp) when it’s turned on but not doing anything to about 1.2A when its LCD screen is in full power-vampire mode. It can peak at about 2A right after taking a picture. If you look at the specifications for AA cells, though, you’ll find that an ordinary AA alkaline is meant to have a capacity of 2.4Ah (amp hours). This means it should be able to deliver 1.2A for two hours before going flat. But it falls far short of this performance. Why? Cell capacities are commonly quoted based on a "C/20" load – a load that flattens the cell in 20 hours. A 2.4Ah AA cell can be asked to deliver more than ten times C/20 by a camera. In this situation, its voltage drops precipitously and its life is greatly reduced; the most demanding cameras draw so much current that they can’t run from alkalines at all! D size alkalines have a capacity of around 15Ah. This makes them rather good value, when you consider that they cost only about 50% more than AAs. The C/20 load for a 15Ah cell is 750mA, so they’re only facing about twice their rated load from the average digital camera. D cells will therefore deliver rather more of their rated capacity into such a load than AAs. But you still won’t get the duration you’d expect. Newer kinds of alkalines like Energizer’s "Advanced Formula" and Duracell’s "Ultra" cells perform a bit better under high-load conditions, but not a lot. Lithium AA cells cost three times as much as alkalines and can in medium-draw applications like film cameras give three times the life – although two times is a better bet – but, again, they don’t much like the super-high loads from digital cameras and will give you poor value for money. "Rechargeable alkaline" cells are worse yet. Don’t even think about using cheap dry cells. Rechargeable cells have capacities much lower than those for alkaline non rechargeable ("primary") cells. About 1Ah is a common rating for good nickel-cadmium (NiCd) and nickel metal hydride (NiMH) rechargeables. Cheap NiCds often have a capacity of only 600mAh; NiMH AA cells are available with capacities up to 1.3Ah. These cells also have a lower output voltage – only 1.2 volts against the 1.5 from non-rechargeables. But they handle high output currents much better than the primary cells, because their internal resistance is more than ten times smaller. Under a 1A load, 1.5 volt alkaline cells of all sizes commonly droop to only 1.1 volts. But a 1.2 volt NiCd’s output voltage will barely droop at all, and it’ll deliver its full rated capacity without breaking a sweat. For this reason, and because they’re much cheaper in the long run, rechargeable cells are very popular among digital camera users. Two or three sets of rechargeables should last for an afternoon of photography, if you go easy on the LCD and flash usage. On the down side, ordinary NiCd chargers take at least a few hours to pump these cells back up again. "Trickle" chargers take about 14 hours. The solution to the long charge times problem is a better charger. For this, forget the electronics store, and go to a hobby shop. You can get a charger intended for model car battery packs for around $100, and many such chargers are eminently capable of charging a digital camera’s cells – all you need to do is buy a 4xAA cell holder for less than $2 and put a connector on it that the charger can plug into or clip onto. And hobby chargers reliably detect the slight voltage drop that signifies end-of-charge, and support charge currents up to five amps or more. Not that this is necessarily a good idea. Charge a set of ordinary AA NiCds at 5A and they’ll probably be too hot to hold at the end of the charge, and may "vent" – ooze electrolyte. High charge currents don’t charge these cells much faster – most of the excess energy is dissipated as heat. For these ordinary low performance NiCds, a charge current of 500mA is plenty, and some hobby chargers do not support this low a charge current. Why? Glad you asked. While you’re at the hobby shop, check out the batteries that the hobby chargers are designed for. Model car packs are built out of special high current C-size cells, the best of which are made by Sanyo. These cells, with capacities of 1.4 or 1.7Ah, can handle repeated 20A discharges with peaks of 40A or more, and endure charge currents of five amps and higher. The super discharge capability isn’t necessary for digital camera applications, but the superfast charging can be handy. At 5A, a 1.7Ah pack can go from flat to full in less than half an hour (you have to put about 1.4 times the capacity of a cell into it to charge it). There are 2Ah cells as well, but they’re more expensive and not quite as tolerant of harsh treatment. All of these cells are NiCd; for a long time, no rechargeable battery technology even approached NiCd’s high current performance. Nowadays, though, you can get sub-C NiMH cells with 3Ah capacity. They're the same size as NiCd sub-Cs, but weigh less, and can tolerate quite rough charging and discharging. There are lots of lower current NiMH cells with capacity well beyond that of NiCds as well; you have to be more careful charging them (they can't be charged as fast, and a charger that says it's only for NiCds is only for NiCds...), but they're a very sensible option for home-made packs. The preceding paragraphs were my way of introducing you to my preferred solution to the camera battery problem – the big fat outboard battery pack. The simplest such pack is a D cell holder with alkaline cells in it. You can get a four D cell holder from any electronics store for a few dollars. The one in the illustration cost $AU2.30 from Jaycar. To connect the holder to the camera, you’ll need a lead that can plug into your digital camera’s AC adaptor connector. If your camera does not have such a connector – some very cheap ones don’t - you’ll need to hack something onto the battery connections, or just get a better camera. The connectors used by digital camera AC adaptors are, almost without exception, simple two-terminal "barrel" plugs. The easiest way to get a suitable lead is to cut one off an AC adaptor, but if that doesn’t appeal, you’ll be pleased to know that electronics stores stock barrel plugs in all sizes. There are several commonly seen sizes, and the 5.5mm outside diameter ones which are most popular have two possible inside diameters, so take the camera and/or an AC adaptor with you and get it right. A connector with too large an inside diameter can result in annoyingly intermittent power. Making up your own cable also allows you to use stouter wire than is used in most plugpack leads. Pretty much any hook-up wire is thick enough to comfortably carry the current drawn by a digital camera, but thin wire is fragile, and a battery pack lead will get twisted, trodden on, pinched in zippers and who knows what else. A good compromise between robustness, manageability and price is medium duty figure-eight speaker cable, or "zip cord", so called because you can "unzip" the two insulated wires from each other by pulling them apart. Check out the offerings at your local electronics store; it should cost you well under a dollar a metre. It helps to have a nice long cable from the pack to the camera, so you can leave the "anchor" sitting on the floor and be able to pace about a bit. For field photography, I keep the battery in my backpack along with the other camera paraphernalia. Smaller batteries fit easily enough into a "bumbag" ("fanny pack", to Americans; in some other parts of the world, this sounds vaguely rude), but this can be rather uncomfortable with larger ones. You’d think having a power plug sticking out of your camera all of the time would be very cumbersome, but with the DC120 at least I’ve found my monster battery pack to interfere surprisingly little with shooting. Putting it all together is a simple soldering job. If you’ve never soldered, this is a great time to learn; an iron, a stand and a big reel of solder will set you back less than $40 (Australian dollars - even less in US currency). If you don’t want to learn, your local electronics technician will be able to do it for you in minutes if asked (and/or paid) nicely. Make sure you get the polarity of the connector right. Most barrel plugs are wired "tip positive"; the outer, "sleeve" terminal of the plug is the negative. If you’re uncertain, use a cheapo multimeter to check the output from the plugpack. You can now buy digital multimeters quite good enough for basic tasks like this for less than $20 from various electronics stores. Even D size alkalines, though, aren’t particularly efficient when driving digital camera loads. NiCds are much better. Really, really BIG NiCds are better yet. The pack I use with my DC120 is made out of NiCds so large that most people don’t even know they exist. They’re Sanyo F size cells, one size up from D, with a capacity of 7Ah. There is only one larger standard size, M, with a 10Ah capacity. I got my F cells from the USA; in Australia you can expect to pay something like $30 each for them. The much more common 4.4Ah D cells sell for about $15 each, and are a rather more sensible proposition. M cells, in case you’re interested, cost the thick end of $70. Each. I’ve GOT a mains adaptor for my DC120, but thanks to the 7Ah pack I practically never use it. I plugged it in for the first time in months in order to get the pictures of my battery pack cabling! Doing things like serial data transfer and LCD screen image reviewing under battery power is a terrible idea if you’re using AA cells, but with the monster pack – no problem. I have never run the big pack flat. Nor, by the way, do I intend to in order to "maintain the pack’s capacity", because I do not subscribe to the myth of "memory effect". If you think your camera, laptop, cellular phone or cordless drill battery suffers from memory effect, you are wrong. Check out http://www.repairfaq.org/ELE/F_NiCd_Memory.html and the full NiCd Battery Frequently Asked Questions file at http://www.repairfaq.org/ELE/F_NiCd_Battery.html before you flame me about this. I ramble on at greater length on this subject here. Eagle-eyed readers will note that my pack contains not four but five cells. The five cell pack gives the camera 6V, with which its motorised zoom works noticeably faster than when it’s running from the 4.8V it gets from four NiCds. Like many electronic devices, the DC120 works from a range of voltages. It will run just fine from four NiCds, but it’s happier with a higher voltage – its mains adaptor is rated at 8V. A NiCd pack that delivers less than the rated voltage of a camera’s mains adaptor should cause no problems; mains adaptors do not deliver less than their rated voltage unless they’re delivering more than their rated current, which you shouldn’t force them to do. When delivering less than their rated current, most plugpacks deliver MORE than their rated voltage. Only "regulated" plugpacks maintain the same voltage at all times. To build a custom battery pack, you’ll need to solder the cells together. Soldering to cells can be tricky – you need a soldering iron with a fairly large tip, and you need to roughen up the ends of the cell a little with sandpaper or a file to encourage the solder to stick – but you can get around the problem by using "tagged" cells, which cost maybe 25 cents more each and have a solder tag sticking out from each end. The tags are very easy to solder to, and can handle currents much higher than a digital camera will ever draw. Do not attempt to solder any kind of cell straight to another cell – use wire in between. If you MUST solder to untagged cells – and you may have to if you want to use really high capacity NiCds for your camera – practice on a few non-rechargeable cells first. Roughen the ends, apply the iron and some solder to "tin" them, then press the wire you intend to use into the solder blob with the iron. If you roughen the ends properly and have a decent iron, it should all be over in five seconds. If you find yourself heating the end of the cell for ages, you’re doing it wrong. Some resellers of NiCd cells, like for example E. H. Yost & Co, offer solder tags as an option on their entire range. The cells don't come from the factory that way, but the resellers weld them on themselves. Done correctly, this is every bit as good as a factory-installed tag. Once you’ve got your tagged cells or learned to solder to untagged ones, arrange your cells as you like, and stick ‘em together. Hot melt glue is a decent adhesive for battery pack assembly – it holds quite firmly, but not TOO firmly, and gives you some time to get the line-up right. The cells should be aligned so it’s easy to wire the positive of each cell to the negative of the next, with the power cable attached to the terminals on the ends of the line. What exact arrangement you use depends on what size cells you’re using and how you intend to carry the pack; shuffle the cells around until you’re happy. You can, if you like, use a sealed lead acid (SLA) "gel cell", as used for standby power in alarm systems, to power your digital camera. Gel cells come in 12V and 6V versions; the 6V batteries will power many digital cameras just fine. I prefer NiCds, though, because lead acid batteries are rather heavier for a given capacity, can’t be charged nearly as fast as a NiCd, and don’t like being run flat. If you flatten a gel cell and don’t charge it fairly promptly, it will die. For this reason, always make sure any gel cell you buy is charged – another use for that cheapo multimeter! If you use alkaline cells in a holder, you only need to solder your cable to the holder. If you go for a rechargeable pack, the battery lead will need a plug and socket arrangement in it somewhere that you can unplug, so you can connect the battery pack to a charger. You could also wire a barrel socket matching the plug to the charger if you liked. My own battery pack has a couple of Anderson connectors with specifications many times higher than are needed for this application. Anything that won’t come unplugged when you don’t want it to will do, but remember the golden rule of all connectors – if there’s a male and a female, the FEMALE connector is the one that should be on the "live" cable that comes out of the battery pack. Otherwise, unplugging the connector will leave a live male connector dangling around, and male connectors are so called because they have protruding terminals, which can easily short out on any metal object. Short circuits are especially bad with NiCd and NiMH cells, because their low internal resistance lets them deliver enormous currents when shorted, and they can and do start fires. If you’ve never charged your NiCd or NiMH cells, they should be flat; that’s the way they come, and that’s the way they should stay while you’re building a pack out of them. These kinds of cells, unlike lead acid batteries, are perfectly happy to stay flat for as long as you like, and putting the pack together while the cells are flat removes the danger of short circuit excitement. Once you’ve built the pack, give it a bit of a charge, check its voltage with your multimeter, and if all is well plug it in and see if it works. Once you’ve verified that it does, mummify it. I wrap large packs with several layers of cloth-backed "Gaffa" tape ("duct tape", to Americans; actually, the Gaffa brand stuff is inferior; Nashua 357 tape is the real gaffers’ choice). You can also get heat-shrink tubing in surprisingly large sizes (again, ask at the hobby shop! ), but it’s hard to beat cloth-backed tape for durability and price. Incidentally, because of the huge current capacity of NiCd cells, it's not a bad idea to put an in-line fuse in the power lead from any NiCd packs you build. If you don't, and the lead shorts out, the cells will probably still not be damaged - but the lead can easily get red hot, then melt. This is probably not exactly what you want to happen in your camera bag. A 5 amp slow-blow fuse should give plenty of headroom for even power-hungry digicams, but will blow long before your cable overheats. On the face of it, Sealed Lead Acid (SLA) batteries of the type used for alarm system battery backup and in computer Uninterruptible Power Supplies (UPSes), to name just a couple of their many applications, look like a good alternative to NiCd. They use much the same basic reaction as a lead-acid car battery, but their jellied electrolyte (they're also referred to as "gel cells") means you can use them in any orientation without suddenly finding yourself covered with sulfuric acid, and they need no maintenance. Five 4Ah 1.2 volt NiCd cells will cost you more than $70 (Australian dollars) retail with no charger, whereas a 6 volt, 4Ah SLA battery is only $20, plus $30 for an "intelligent" plug-pack charger that'll switch to a gentle trickle mode when the battery's full. It looks like a no-brain decision, doesn't it? They're darned heavy. SLA weighs roughly twice as much as NiCd for the same capacity. They take up about the same amount of space, but if you're on the road, or just wandering around a party, you'll be acutely aware that the word "lead" in their title is not just there for show. They've got a smooth discharge curve. NiCds keep their voltage almost steady for almost all of their discharge, whereas SLAs fade away more rapidly, so in some applications you can't use the last 10% or 20% of the battery's capacity because the device being powered thinks its battery is flat. This is not normally a problem with digital cameras, because they're made to work with alkalines, which droop severely under a 1A load even when new. SLAs don't like going flat. If you run a lead acid battery flat and leave it for several hours, it'll sulfate and you might as well throw it away. Even the deep-cycle traction batteries don't like being flat for too long. SLAs definitely can't be left flat. Slow charging. 10 hours is about as fast as you can charge a SLA. You can charge even plain, non-fast-charge NiCds in 90 minutes with a good charger; fast charge NiCds can be charged in less than 30 minutes. If you've already got a pile of camera gear, throwing a couple more kilos of battery in there won't make too much difference, I suppose. But most digital camera users don't have a lot of accessories (because they can't have a lot of accessories - there just aren't that many available for most digital cameras!) and it's a pain to tote around a super-heavy battery. But they're cheap, all right. If you mostly stay in one place, or you don't mind lugging a really dense battery pack around, SLA could fit the bill. All good electronics stores stock them, so when you go shopping for battery options, pick one up and see how you feel about it. Personally, I and my underdeveloped musculature are sticking with NiCd. On the right, the cheap way to make your digital camera run for longer. On the left, the proper way. The little yellow cells are standard Sanyo 950mAh AA size NiCds. 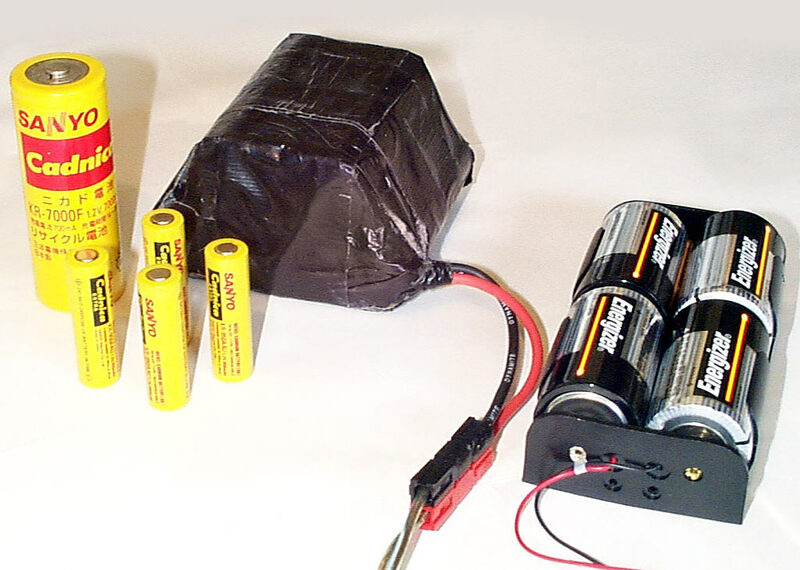 The big sucker behind them is a 7Ah F cell, five of which lurk inside the black battery pack. On the big pack, and on the charger, I use Anderson connectors (known to some as Sermos connectors, or under other brand names; they're all made by Anderson, though). Anderson connectors handle very high currents and can be clipped together into whatever number of terminals you need, but they're a little tricky to solder - they're meant to be crimped to the wire with a special tool. It's easy to hook a couple of Anderson connectors to a AA cell holder to charge your camera cells. Just make sure you don't charge ordinary AA NiCds at more than about 500mA - even that is far too much for the cheap 600mA ones. Alternative power sources need a compatible plug. Here's the one I use with my DC120. It's actually one of the five plugs a cheap plugpack came with; the interchangeable plugs have pins sticking out that are easy to solder to. The cheap 3-D-cell torches ("flashlights", to Americans) that you can buy in supermarkets are designed with alkaline voltage droop in mind. They generate a quite respectable amount of light, especially when you consider that they usually cost only about as much as the three D cells you put in them. But their bulbs are rated at 3.6 volts. If the D cells delivered full voltage, they’d output 4.5 volts between them and the bulb wouldn’t last long. Further confusion is created by the fact that measuring the resistance of a typical cheap 3.6V torch bulb will generally give you a figure of about 0.4 ohms (if you get more, remember that your test leads probably contribute something like 0.3 ohms; touch them together and see what they read). Since voltage equals current times resistance (V=IR), and assuming a 4.5 volt supply, a naïve calculation based on a 0.4 ohm bulb gives a current of a honking 11.25 amps, for a total power of more than 50 watts! Even from 3.6 volts, the numbers work out at 9A and more than 32 watts – what’s going on?! The mystery is solved when you discover that incandescent filaments have a much higher resistance when hot than when cold. The actual current flow in a three D cell torch with a common-or-garden 3.6 volt globe is a mere 750mA or so; the bulb resistance jumps to about 4.75 ohms when it’s hot. The battery voltage slumps, beautifully, to almost exactly 3.6V; the total power is a mere 2.7 or so watts. Run the torch from NiCd cells and you’ll get the same result, because the NiCds are 1.2 volts each and don’t droop significantly under this much load. Similarly, a 12V 50W halogen lamp’s filament resistance, when cold, is down around 0.2 ohms. Again, a naïve calculation based on a 12V supply would suggest a huge current (60 amps!) and an outrageous power output (720 watts!). If this were so, halogen downlights would hurt. In most halogen systems, there’s no supply voltage slump to worry about – the transformers the lamps run from are designed to put out 12V with the rated number of lamps connected. At 12V, about 4.15 amps flows, giving a power of almost exactly 50 watts. The lamp resistance has jumped to about 2.9 ohms.